The first electrochemical battery was documented by Alessandro Volta in a letter to the Royal Society of London in 1800. 1780 Volta's friend Luigi Galvani discovered that contact of two different metals with the muscle of a frog resulted in the generation of an electric current. A battery is made up of a number of cells. A primary cell has a chemistry that is not rechargeable while a secondary cell can be recharged. A battery may have more than one output voltage either by means of taps in a single string of cells or by separate strings of cells. There are many chemistry types used for an individual cell and the cell voltage depends on the chemistry. 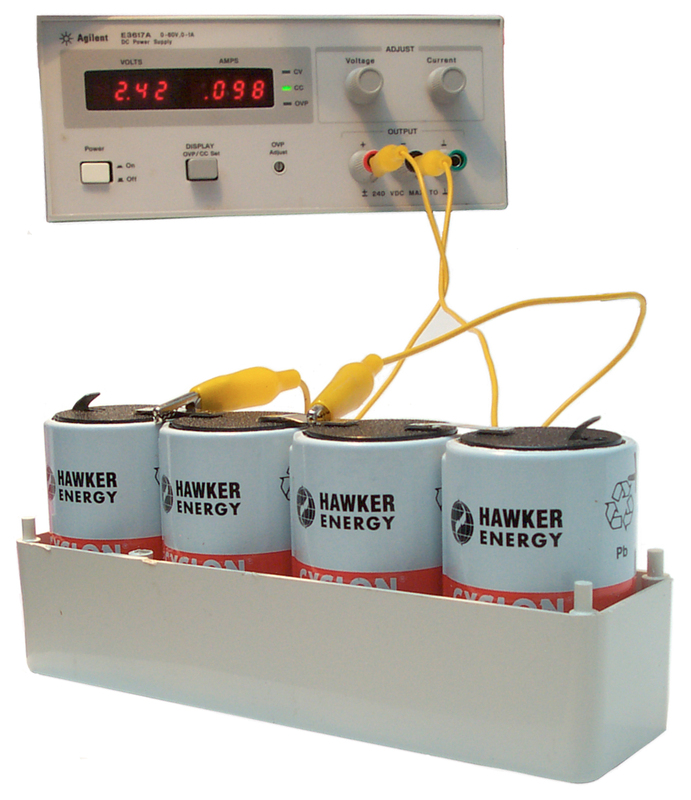 Typically a battery's capacity is expressed in ampere hours and is for a discharge rate of the capacity divided by 20. A Battery is an energy storage device. If the energy is allowed to escape in an unintended way it can be dangerous. Some batteries will over heat if they are discharged at a rate higher than the designers planed for. In some cases a fuse may blow, but on more modern batteries there are no longer protection fuses so that the battery can deliver high peak currents. A short can generate very high currents, enough to vaporize a finger ring or turn it red hot in a fraction of a second. A low resistance dead short may cause a battery to explode, catch fire or vent a gas you don't want to breathe. Putting energy into a battery has a number of hazards and can cause the battery to explode, vent gas, or catch fire or all of these. See Shipping below for more. Submarines and passenger carrying aircraft do not allow certain types of batteries to be carried if the total mass is above some specified weight. It may be on the order of what one person can use during a flight. There were over a thousand Mercury batteries used on many Military programs (BA-1001 through BA-1999 plus others). They had very good shelf life and high energy density, but Mercury is one of the heavy metals that cause medical problems and does not readily decompose when in the ground. Based on July 2003 Radio Shack pricing for the largest quanity package. Primary Alkaline batteries. Using electrical data from Energizer since it's on line. Online prices Feb 2007 - The cents per Watt Hour is just an approximation since prices vary a lot. If you know the load voltage and current then you can figure out the run time. For example a high brightness LED may consume 1.26 Watts (3.6 V @ 350 ma). If it takes at least 6 volts to run that would be 6 cells when they are about dead (1 v/cell). 25.8 WH / 1.26 Watts = 20.5 hours which times 80% power supply efficiency = 16 hours of run time. It looks like you get the most Watt Hours from AA or C cells. Interesting that the capacity does NOT change with different loads. Normally when a battery is run with a higher current load it's capacity decreases. But these Li-Ion cells are not showing any change in capacity between 0.35 and 1.0 amps. (2) charged with the supplied "DSD" 2 cell charger from Quality China Goods. (3) the stop voltage is not too critical since the voltage falls like a rock in this area. Advanced Power Products - dealer? Elna - Double Layer Caps - 0.047 to 100 Farads Note: even though called low ESR it may be 30 to 120 Ohms! for backup not energy. Motorola - cell phone batt. Odyssey - rechargable battery with benefits of primary battery Highly Recomended (USDOT "non spilable" can ship using any method) - shop for price. Special charging requirements. Quality China Goods - English on line ordering - about 2 weeks delivery time. Radio Reconnaissance Technologies (RRT) Inc. - BC-778(A) direct replacement for BA-5590/U lithium sulfur dioxide battery uses 32 each BA-5123/U (CR-123) - no longer on their web page, now seems to be just a reseller? Radio Shack - carries many battery types. I have included super caps because there is a fine line between a battery and a super cap. These have application as a keep alive power source for electronics. For example the HP Rocky Mountain Workstation computers have a super cap that keeps the clock running for weeks. When they arrive from the factory the clock is correct. The U.S. Army is looking into using them in parallel with a vehicle battery to supply the high current starting energy thus saving the battery from this big load. 2003 - I have seen ads for Super Caps with 100 and 1,000 Farads. But typically each individual cap is rated for only 2.5 Volts. This is a problem because you can not easily add them in series. Another problem is that most if not all of the super caps you see advertised for hobbyist use are "memory backup" types and can NOT deliver a high current. They are fine for keeping a memory alive that draws a very small current, but no good for supplying any kind of current. For more on charging see the 5590BA web page for charging experiments. Seperate web page for Battery Chargers. A 12V 7AH Gel Cell battery would not take a charge. After popping off the lid and removing the 6 rubber caps there appears to be no water covering the plates. So I'm putting some water in a puddle above each hole and after many hours (that's when I check on it) most of the water has gone inside. 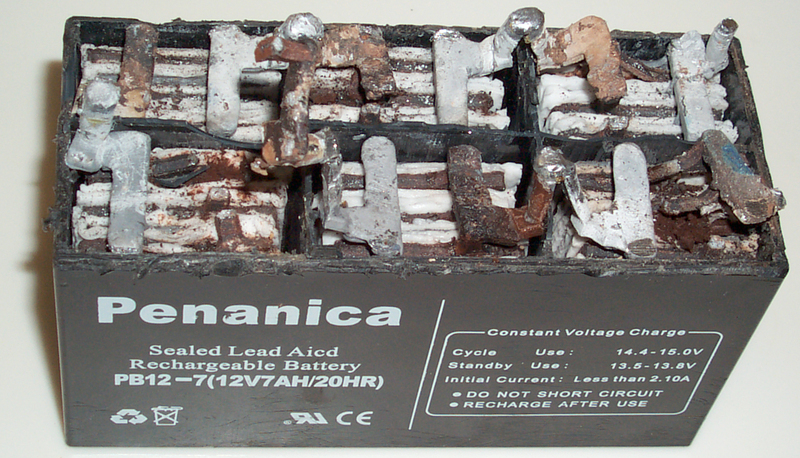 Often a "battery" is made up of standard letter size (AA, AAA, C, D) cells and can be opened up and rebuilt. Unfortunately the small straps that connect the cells are usually spot welded, not soldered, it's a neater way to connect but not a tool in most homes. This is also called Re-celling. 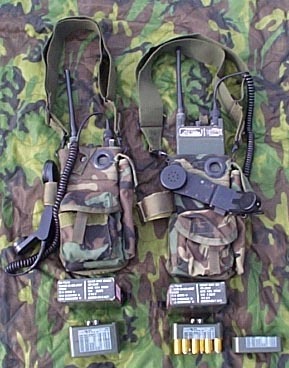 Photo of PRC-68 radios with a PRC-68 "battery" sawed in half). Provide the same outputs as the battery being replaced using A.C. line or vehicle D.C. power as inputs. By using a Battery Adapter it's possible to use common batteries to replace either a specialized battery or a larger battery or cell. For example you can buy plastic battery adapters that allow the use of a "C" cell in an application where a "D" cell is needed. In the case of the SDU-5/E Distress Strobe Light, the original battery was Mercury based and is now obsolete. The replacement battery is very expensive. By using my 5BA Battery Adapter the strobe can be powered by two common 123 photo batteries. 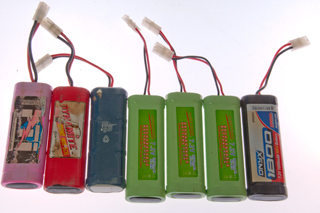 Allow using a number of batteries of one type to look like another type. For example I have one that uses a lot of 9 Volt batteries for the PRC-6. The BA-491 powers the PRC-6 with D cells. See the BA-5590 web page for a discussion about when a "12 Volt battery" is really a 15 Volt battery. For batteries with a steep discharge curve simply measuring the terminal voltage (maybe with a small load) is adaquate to know the SOC. For batteries, like Nickel Metal Hydride or NiCad where the curve is almost flat and there are temperature effects, the terminal voltage is not a good method (although if a temperature sensor is part of the battery, not added on) it may work. For these measuring curent * time called coulometry is the best method. http://www.moltechpower.com/ may be a source for more information. State of Charge Tester, Chemtronics LS 91(TS-4403/U) - a microprocessor controls an electronic load and monitors the voltage, current draw and temperature made for the BA-5590/U and BA-5598/U. TS-4403A/U - NSN 6625-01-370-8278 is a SOC meter that can test the batteries used on Squad Radios.df The TS-4403A/U is the same as the LS 91 (now renamed LS 94) and probably has a different EEPROM with the data for the BA-5588/U. 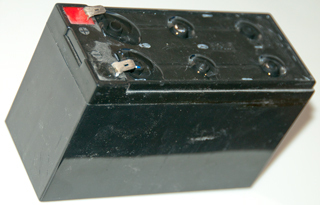 TS-183, -183A, -183B - Separate Web Page with large Battery Type Table, NSNs, Replacement numbers, etc. These are functionally variable resistors, except that they can be set for constant current, resistance, voltage or power (dempending or model and mfg.) and most have readback of voltage and current and some have remote programming capability. Could be used as a automated version of the TS-183 or other battery testers. Moved to Battery Tester web page. Flash Amps is a measure of the short current that a battery can deliver for a very short time. Although it's not an indicator of state of charge it IS an indicator of what the battery is capable of. Also an important thing to match when making a battery pack. In the case of RC batteries the max current available must be larger than the current needed to drive the motor(s). This did not happen recently (Sep 2013) in the case of the Tamiya Grasshopper RC model dune buggy. New 3800 mAh batteries failed to power the motor (see video at link above), but another new battery with a lower capacity (Duratrax Onyx 1800 mAh) worked fine. Note the huge difference in internal resistance and calculated short current current in the table below. Note 1: Smoke came out of the ESR-Cap meter. Maybe I connected it with the leads reversed? Note 2: Now have SM8124 Battery Internal Resistance meter. There's no question that the "New" Ni-MH batteries although they have a higher mAh rating (3800) than all the other batteries, they also have a much higher internal resistance thus limiting their output current. The current shown on the bottom line is the battery voltage divided by it's internal resistance. Theyall have been sitting for over a month untouched so the older batteries have discharged more (or didn't take a charge that well before). It's a shame that the battery vendors do not specify internal resistance or short circuit current. Next Generation Alkaline, U.S. intro 2006, already selling in Japan. Belville washers (springs) to apply 200 psi to module, heat sink to cool cold side, module in shadow (insulation in this plane), input heat absorber to be used in pellet heater flame. The idea is to have a radioactive source bombard what amounts to a solar panel that's generating electricity directly from the radiation. These do work, but produce a very small amount of electricity. 6118204 Layered metal foil semiconductor power device Sep 12, 2000 310/303; 136/202; 429/5 - has a description of a number of different types of electrical generators powered by radioactive material. 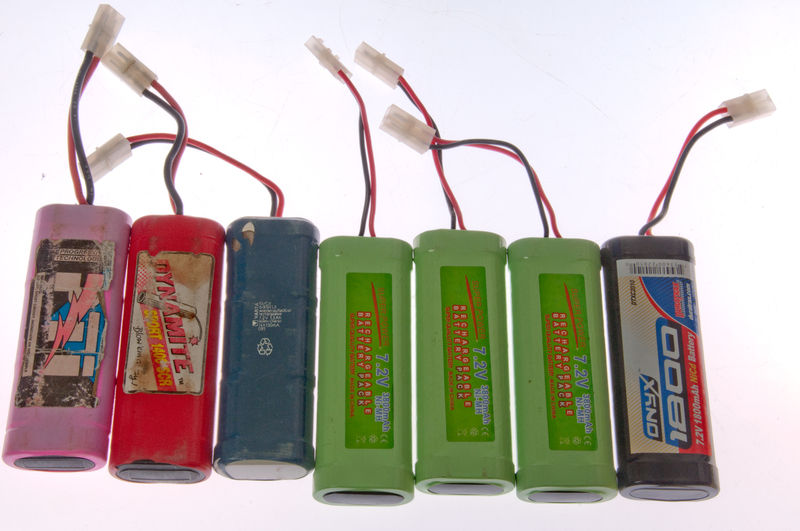 I've come across these as backup batteries in frequency standards (O-1814 & 4065B). They come in a number of configurations including a "D" cell size rated 2 volts and 2.5 AH. When left for a long time they go open. But might be reclaimed by applying say 60+ volts to a single cell current limited to less than C/20. The higher voltage helps develop some current and once a reasonable current starts then it will continue. After it's taking charge change the supply to constant voltage at 2.4 Volts/cell and limit the current to maybe 3 Amps. The normal charge voltage can not get the reaction started and if any one series cell will not start then the whole pack can not be charged. Valence Technology - adds fire suppresent to Li-Ion battery to make it safer thus allowing larger batteries to be made. Heat can be used to generate electricity. One way uses the Seebeck effect in a thermocouple. Since a thermocouple is formed by welding two dissimilar metals toghther it has a very low source resistance and produces voltage that's proportional to the temperature difference between the hot and cold ends of the wire. Note that it can not produce any power with just one junction. Thermocouples are used with gas pilot lights as a safety mechanism. If the pilot light goes out then the power stops allowing a valve to close. 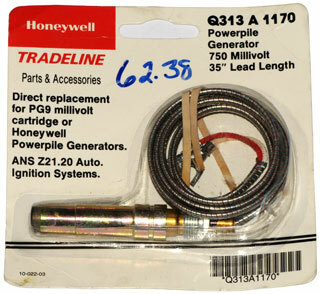 One type is the Honeywell Q313 xxxx "750 millivolt" type that has a number of series connected thermocouples to make a thermopile. A single thermocouple in a gas flame might produce 30 mV open circuit and so about 25 series connected thermocouples are in one "750 millivolt" thermopile. It can be seen that as the load resistance gets lower and lower the output power increases. Maximum power will be generated when the load resistance is the same as the source resistance, which for practical purposes means a short. A modern Switching Mode Power Supply might be the way to convert this low impedance power into a more useable form. Note that the above thermopile runs from a pilot flame or maybe a candle flame. I was just web surfing "Burp Charging" and found this statement " Some battery manufacturers do not fully form the cells before shipment." The implication is that the others that do ship fully charged batteries are the good guys, but that's not the case, it may be the other way around. If a short circuit developed during shipment a fully charged battery is more dangerous than a half charged battery. Many of the modern battery chemistries are classified as hazardous material by the U.N. and other rule making bodies. For example the BA-2590/U is a LiSO2 chemistry and if a cell is punctured the liquid SO2 will escape as a hazardous gas so these batteries can not be shipped on passenger aircraft. NTSB report of fire caused by Lithium batteries, maybe the "123" type. Note that Lithium has a very low burning flash point and can feed a fire making it very difficult to extinguish. UPS aircraft battery fire - On February 7, 2006, at 2359 eastern standard time, a Douglas DC-8-71F, N748UP, operated by United Parcel Service (UPS) as flight 1307, landed at Philadelphia International Airport (PHL), Philadelphia, Pennsylvania, after the crew reported a cargo smoke indication. The three crewmembers were able to evacuate the airplane using the L1 slide. The airplane later became engulfed in flames and was substantially damaged by fire. A battery is an energy storage device like the gas tank in a car stores energy. Batteries like Ni-Cad and Ni-MH are supposed to be shipped with a 50% charge. This minimizes the energy content in case of an accident. Dec 2014 - ordered a couple dozen CR123 batteries from Battery Space and they came Fedex (the lowest cost option since USPS does not allow batteries at all. Fedex has a sheet where one side is about primary batteries and the back is for rechargeable batteries and the allowable weight/capacity. They have this down and the shipping was under $10 and they arrived (from within California) the next day. The actual volume for the batteries is maybe 1/10 that of the package, i.e. they were will padded. I have purchased some 12v 7AH SLA type batteries on eBay and the seller either does not know or is incapable of properly packaging the batteries for shipment. On the first attempt white packing plastic peanuts were used. These crushed to paper thin allowing the two batteries to pound on each other and to break a hole into the carton. One battery physically destroyed. On the second attempt a single layer of 1/4 thick bubble wrap was used on each of the two batteries and the were placed into a carton that would hold about 8 batteries, so there was a lot of air space. One of these batteries appeared to be OK based on charging, but under any load instantly quit. Not sure way. After opening it up all the cell pockets were completely dry, but that may be how they should look? Batteries Plus - maybe they rebuild rechargeable packs? Battery Comparisons by Mike ? "Power Up" by Dave Strom "How to make your battery adapters for portable and military radios and other non-military electronics" ISBN # 0-939780-22-4 at CRB Books -> 2007 obsolete - (Note: the ArmyRadio web site and Netscape conflict, turn off Java to see the site.) Note many of these adapters use now obsolete Mercury batteries. This is the [an error occurred while processing this directive] time this page has been accessed since 11 Oct. 2000.